Something to remember in the cold weather we’ve been having – especially during the below zero temps we had in early December – is to check your home for frozen pipes. Here’s a step-by-step. 1. Check faucets that are in areas of your home that don’t get used often…downstairs or extra/unused bathrooms, showers and/or bathtubs. 2. For each faucet, turn on the hot water – let it run till it’s hot. Turn it off. Then turn on the cold water and let it run for a bit. 3. 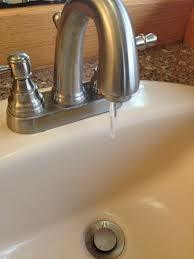 If no water comes out of the faucet, you may have a problem. The thing with frozen pipes is you usually won’t know they are frozen until they thaw out and you have water everywhere. So check them often when the weather is cold, especially if it is below zero. That way you can get it fixed before it becomes a larger issue. This entry was posted in Plumbing and tagged below zero, check your home, frozen pipes, pipes.